A brand new snowcat cab leaves Metal Form Industries in Innisvale, Alberta. This cab is not for Chatter Creek, it's bound for a more exotic place. Scroll down to find out. 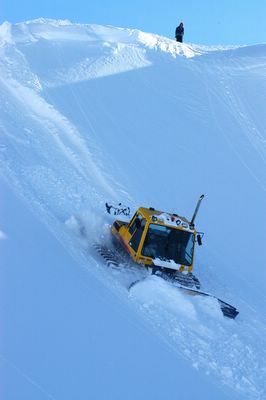 Scroll down to see our photos of snowcats at work at Chatter Creek Snowcat Skiing. Click any Chatter News photo to enlarge it. Use the browser's "back" button to return. Not very exciting for clients, but Chatter Creek has acquired a 2003 Bombardier (Camoplast) "BR 350 MP" snowcat for road building. 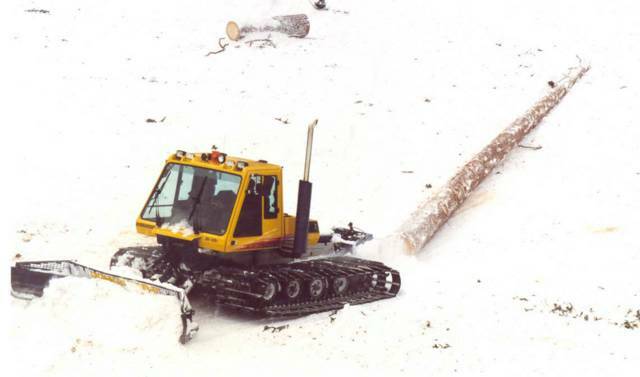 It is a more powerful machine than the old "BR 400" and its blade lifts higher. It's about 30% more powerful than the "ME" machines that are used for transporting guests. The BR 400 will remain the backup machine for passenger use, but mainly it will be used for maintaining the access road for passage of staff and supplies and for hauling fuel to the site. With the new terrain expansion, there is well over 100 km of cat roads to build and maintain and the new cat will greatly speed that process. The photo above shows Chatter Creek owner and cat driver extraordinaire, Dale McKnight with the new BR 350 "road cat". This "MP" (microporcessor) machine uses electronic controls for the hydraulics, whereas the "ME" machines have mechanical controls. 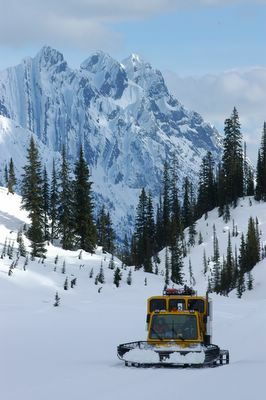 Below, we've added a number of photos from the manufacturing facility of Metal Form Industries, who supplies the luxury passenger cabs for the Chatter Creek snowcats. 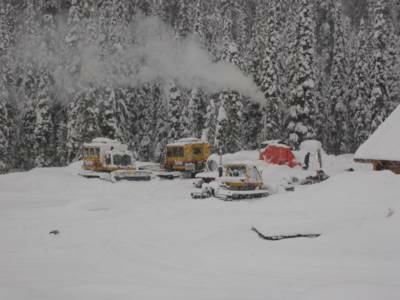 The photo at the right shows Chatter Creek's three Metal Form cabs awaiting the return of the snowcats from their annual overhaul by Camoplast Industries in Calgary, Alberta. This photo gallery about Bombardier (Camoplast) Snowcats is part of Chatter News, giving a guest's perspective on snowcat skiing at Chatter Creek. 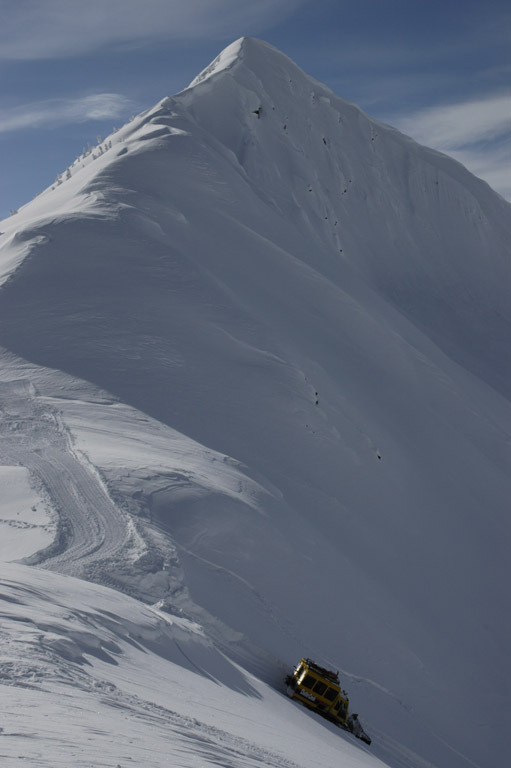 Also take a look at Ski Photography by Mark Gallup and Glacier Skiing at Chatter Creek or use any of the other links at the top of this page. Scroll down for more. 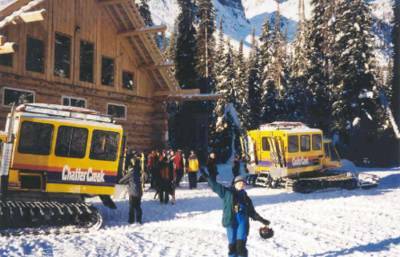 At Chatter Creek Mountain Lodges (Chatter Creek Snowcat Skiing), Bombardier (Camoplast) snowcats with comfortable Metal Form cabs are used to transport cat skiers and cat boarders to elevations nearing 10,000 ft. to ski and ride the Rocky Mountain powder snow. 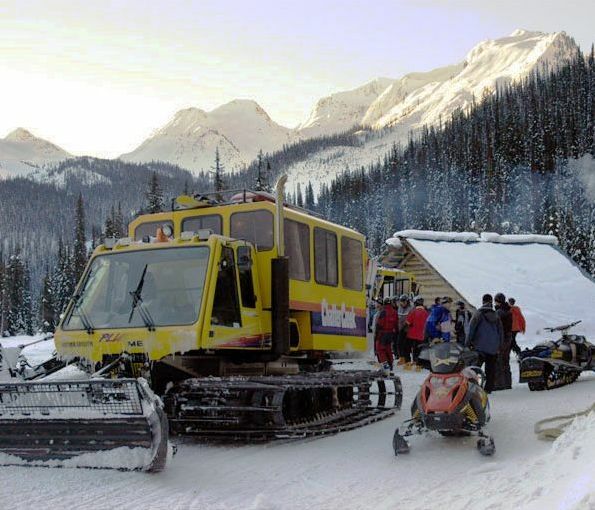 Chatter Creek has four Bombardier (Camoplast) Snowcats, three "ME Plus" machines used for carrying groups of 12 skiers and snowboarders and one "BR 400" which is used as a standby unit and for building winter snow roads. Note that Bombardier Snowcats are now products of Camoplast Industries (scroll to bottom). 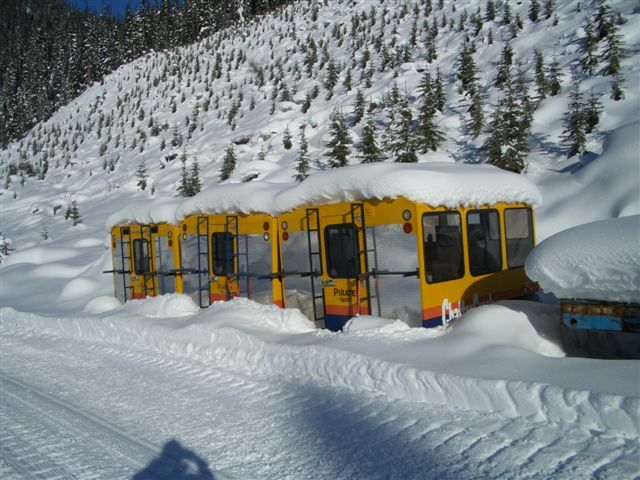 The three "service" cats are fitted with heated and ventilated 12-person cabs containing 12 forward-facing cloth-upholstered seats and two collapsible rear-facing "jump-seats". There is a backup cab for the "road cat", when required. 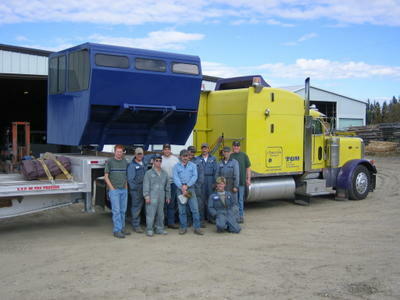 The cabs are manufactured by Metal Form Industries of Innisfail, Alberta. 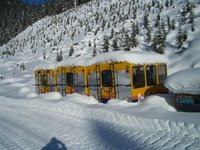 Scroll down for more comments on the Metal Form snowcat cabs. Scroll down for information on Chatter Creeks purchase and maintanenace policies for it's Bombardier (now Camoplast) snowcats. 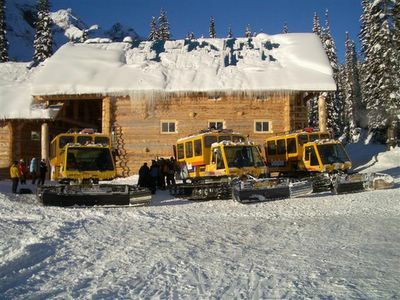 The three "ME Plus" Bombardier (Camoplast) cats in front of Chatter Creek's Vertebrae and Solitude Lodges. 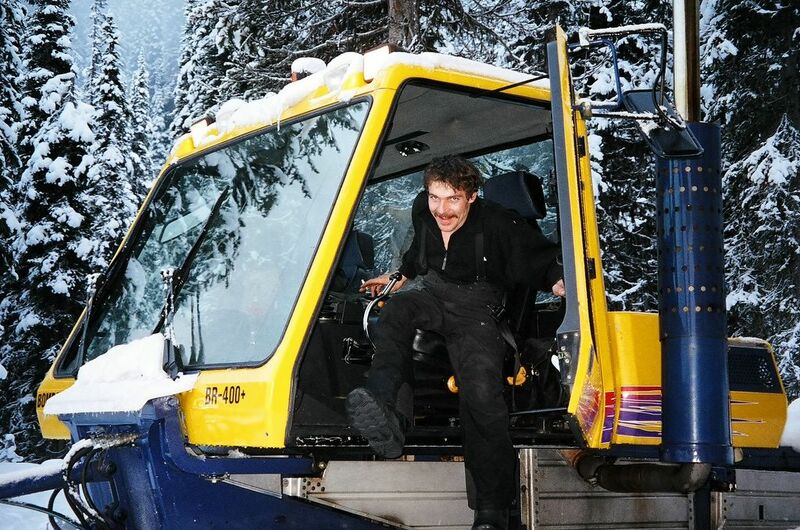 From another time and another place, here's a Bombardier winch cat hard at work building a World Cup downhill course. 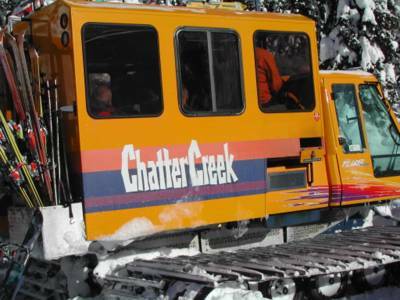 A Chatter Creek Bombardier (Camoplast) snowcat with Vertebrae Ridge rising behind. 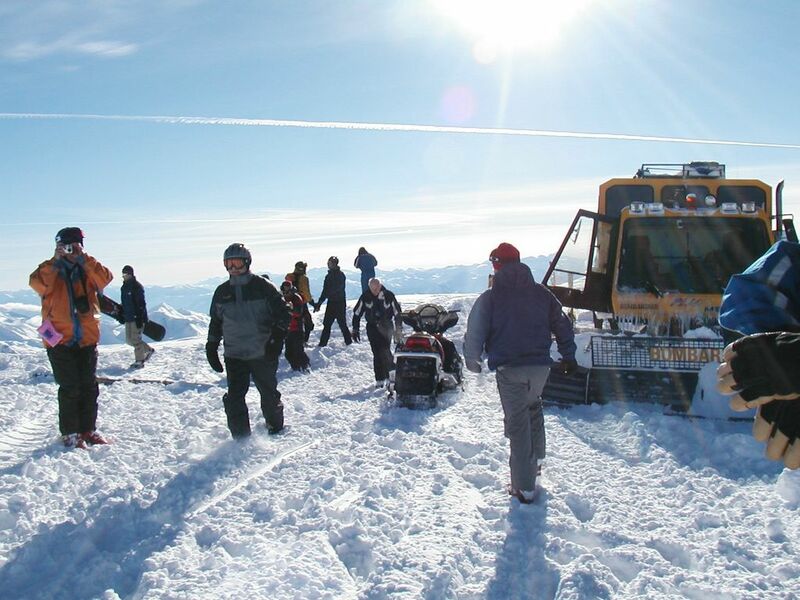 In a few kilometers, this cat will transport 12 guests and two guides to the highest elevation of Vertebrae Ridge. 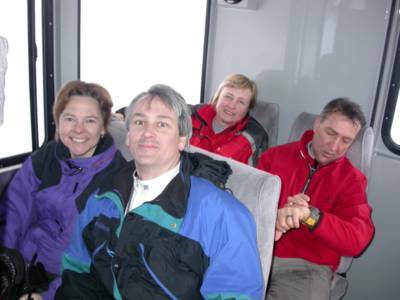 The passengers enjoy a warm, quiet, smooth and comfortable ride. 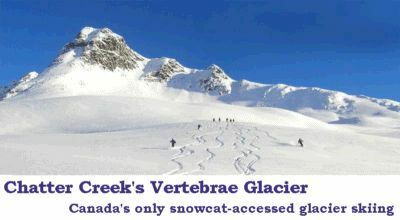 To follow this journey, look at our "Road to Vertebrae Glacier" photo gallery. Thanks to John Dougall for this photo. The BR 400 road cat in "free fall", putting in a new pickup road at Chatter Creek. 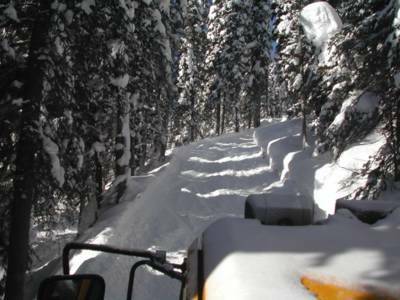 By the end of the 2005 winter season, Chatter Creek will have over 150 km of cat roads in it's tenure, which will soon expand by 86% to 93 sq. miles. The 150 km. inventory of roads will include a limited excursion into the additional terrain. Most of the roads are "snow roads". Cats parked behind the lodge. 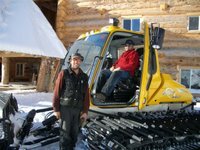 The Chatter Creek operators look forward to building a proper shop so maintenance and repairs don't have to be done so close to Mother Nature. The smoke in the background comes from the outdoor furnace used to heat about 18,000 sq ft of lodge buildings and to provide hot water. More recently, the outdoor furnace and the woodpile have been covered by a woodshed. The seats in the Metal Form cabs are upholstered and comfortable and those in the first two rows recline. The backs of the seats have pockets for water bottles. Spare clothes can be stowed in overhead bins. Gentlemen, set your altimeters. We're going to climb over 4000 ft.! The Metal Form cabs hold three rows of four seats each. The front row is raised to clear the engine. 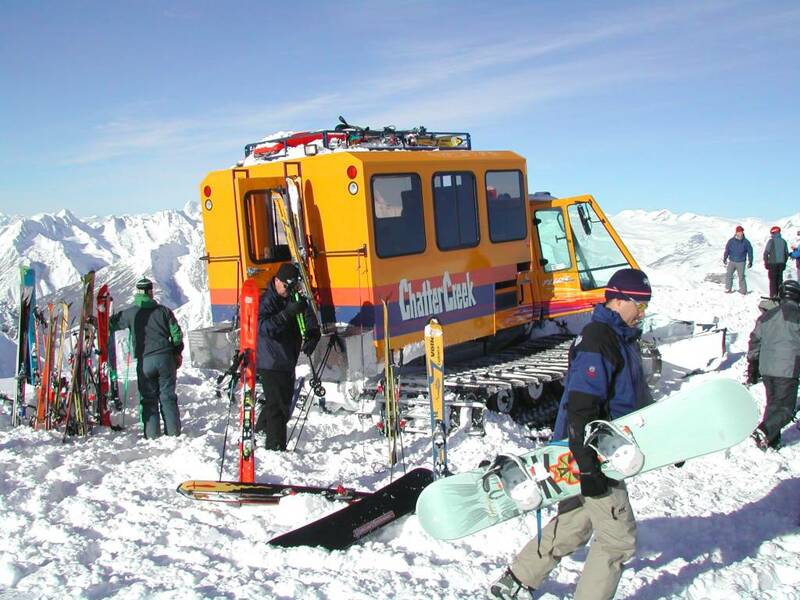 Skis are strapped into the stand-up racks so they cannot bounce out. The cats carry their load of 12 guests and 2 guides to drop-off points as high as about 9600 ft. and do pick-ups at elevations as low as 4900 ft elevation. 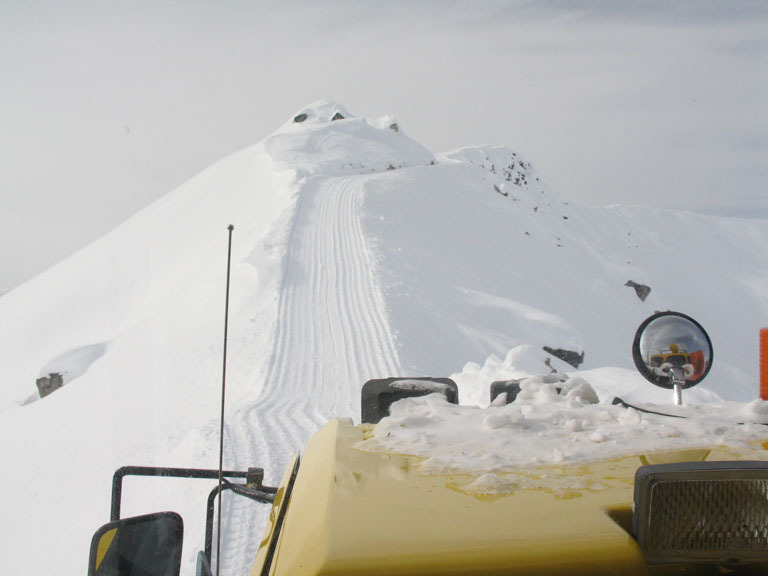 Check out the road to Vertebrae glacier and glacier skiing at Chatter Creek. 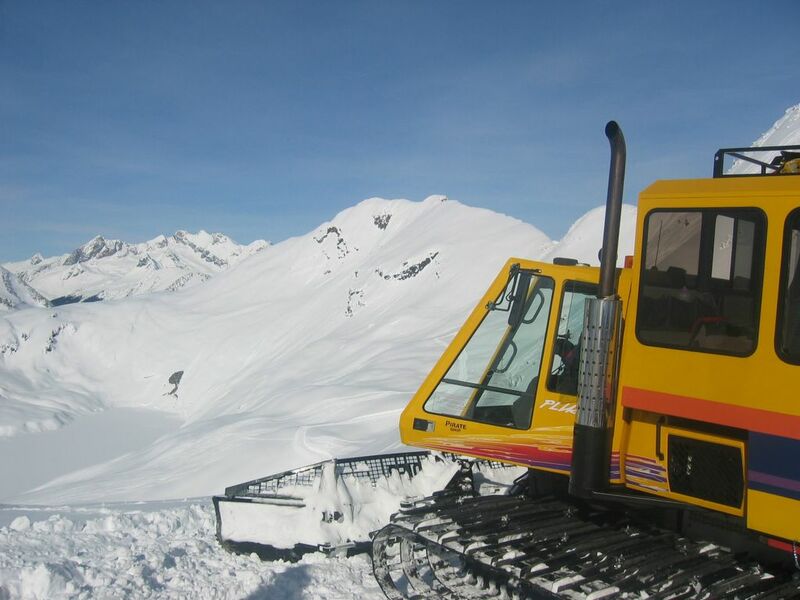 A brand new snowcat cab ready for delivery. Metal Form Industries builds cabs for a number of purposes including snowcats and a variety of oil field service vehicles. 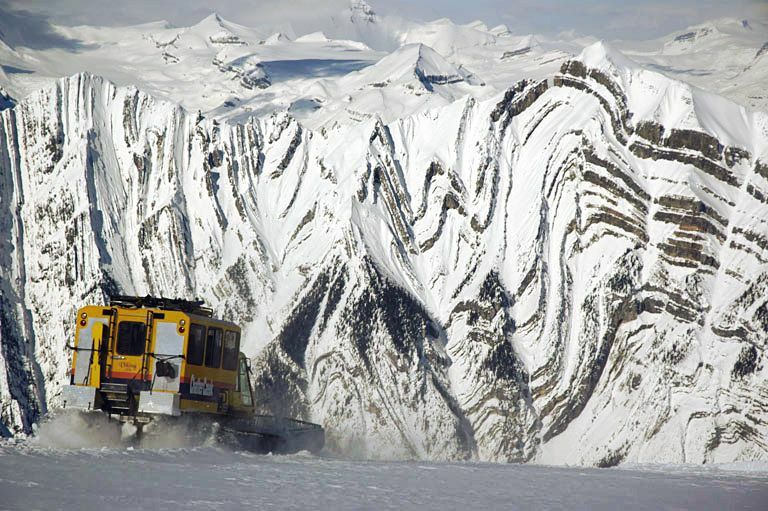 All of the lads in the Metal Form shop pose here with the first of a new design, a cab for the brand new Camoplast (Bombardier) BR-350 snowcat. Its new home will be in Antartica. This cab seats 8 or 9 in comfortable bucket seats and like the Chatter Creek cabs, features large windows for good visibility. 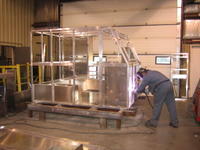 Scroll down for more photos from the Metal Form Industries manufacturing facillity in Innisfail, Alberta. Click on any image to enlarge it. 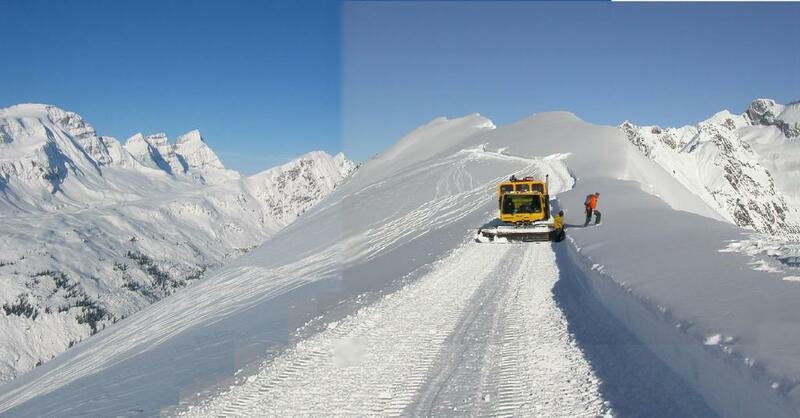 A typical sub-alpine winter road. 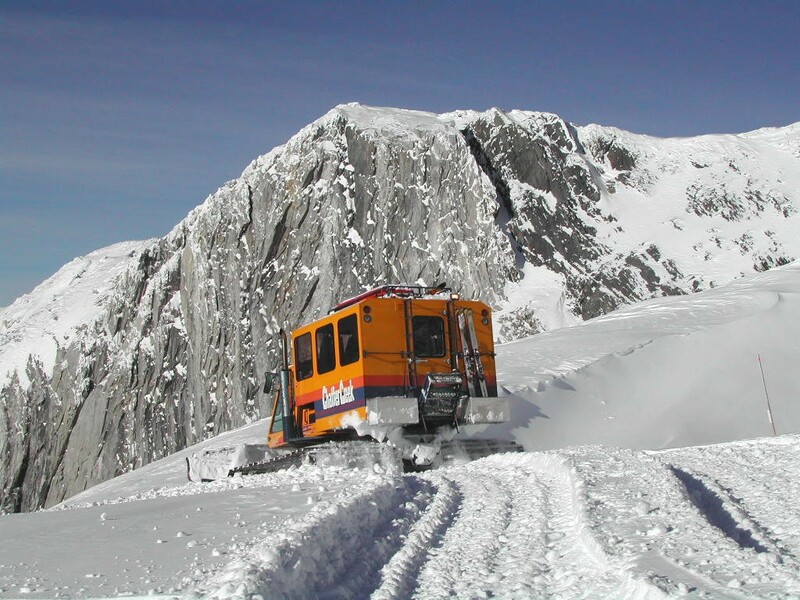 The road to the Vertebrae glacier rises about 1200 ft before breaking out into the alpine, below Megahoop. There are many excellent tree runs off these lower roads. Loading up after a run in the trees. 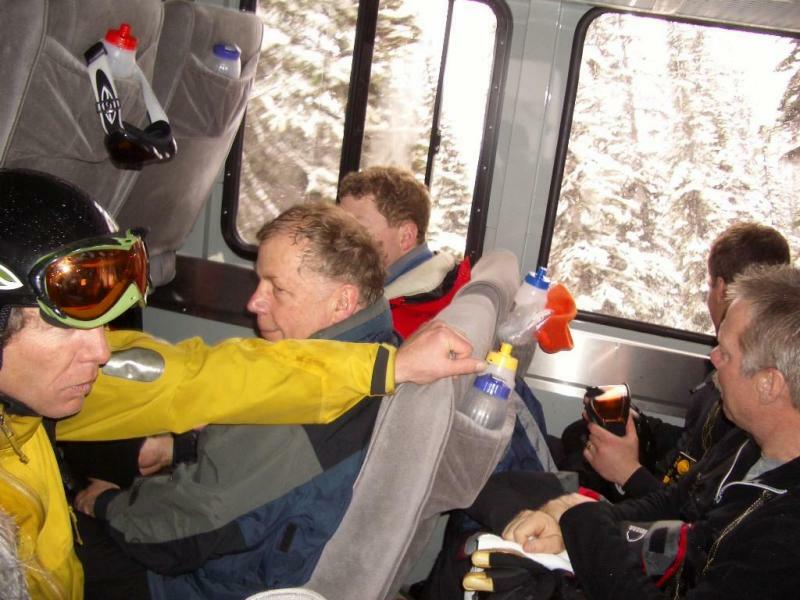 Almost aways, we ski from the cat, to the cat. There is rarely any hiking (which can be a real pain for boarders in deep snow) and very little skiing on the cat roads. With rear entry, the Metal Form Industries cabs enhance safety by removing any requirement for passengers to walk on the slippery treads. The Metal Form cabs are of light weight aluminum construction and have proven to be very durable. 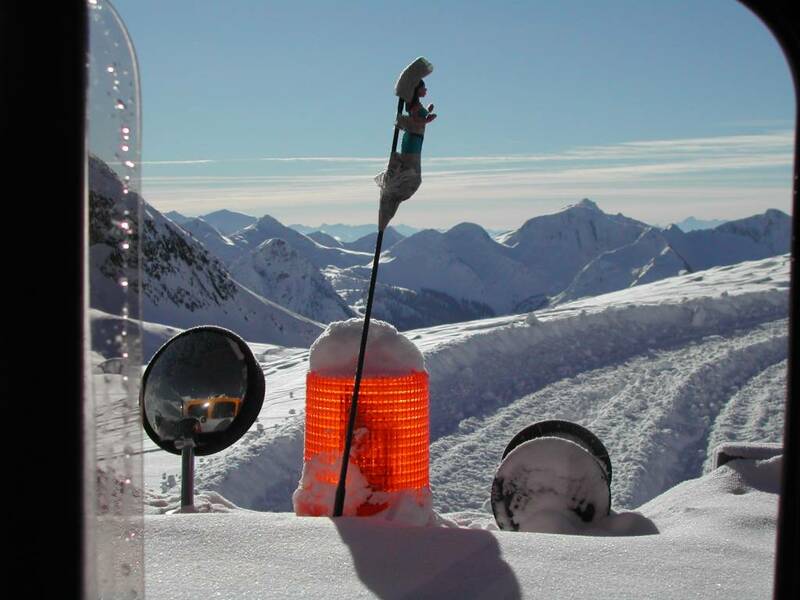 In general, pickups are done where the ski run ends. At Chatter Creek it is rare that skiers must ski out to a pickup point that is common to a number of runs. 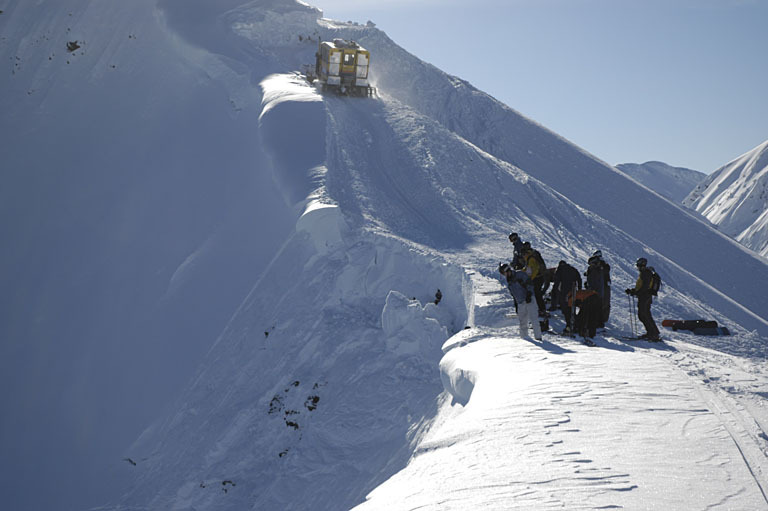 On many runs, there is more than one potential pickup spot, so guides may cut short a run if the conditions at the bottom are not up to standard. Guests who find they want an extra rest can ride back down the mountain in the front, with the cat driver. The views are spectacular and it's always interesting to get to know the staff a little better and to learn more about the snowcat skiing operation. 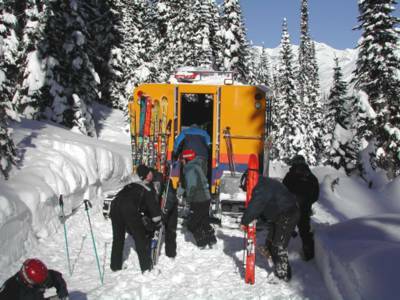 Loading and unloading skis and snowboards is a bit of a chore for the cat driver and the guides. 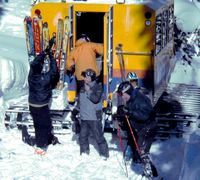 However, the stand-up racks are a lot easier on clients' skies than baskets in which skis lie horizontal, piled on top of one another. The yellow Volkl Explosiv skis in the center of the photo are typical of the rental skis available at Chatter Creek. They ride well and are very easy to turn. The cat drivers don't waste any time in heading off down the hill to the next pickup point. 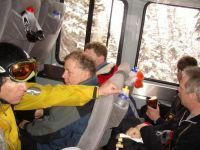 The cat driver stays in radio contact with the guides, so each knows where the other is. That's not usually an issue in the alpine, but it's important when skiing the trees. As Don Steedman leads the way, the cat is already far below us. 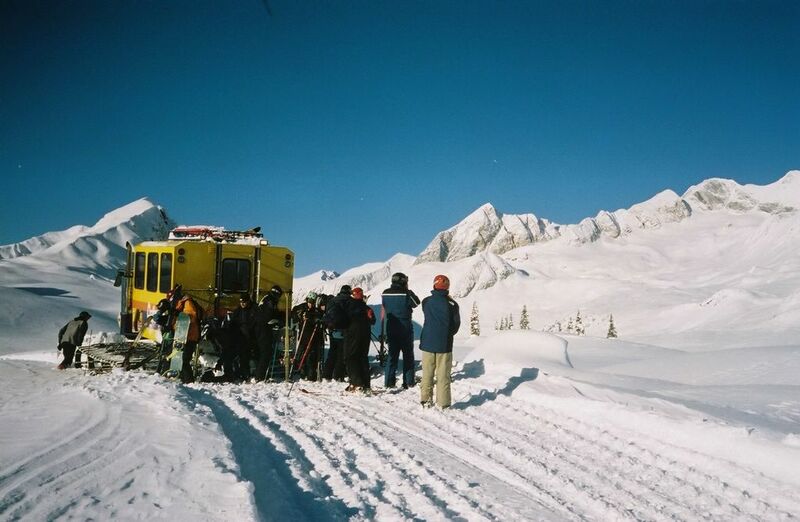 There is rarely much of a wait for the cat at the pickup, even with groups of fast skiers. 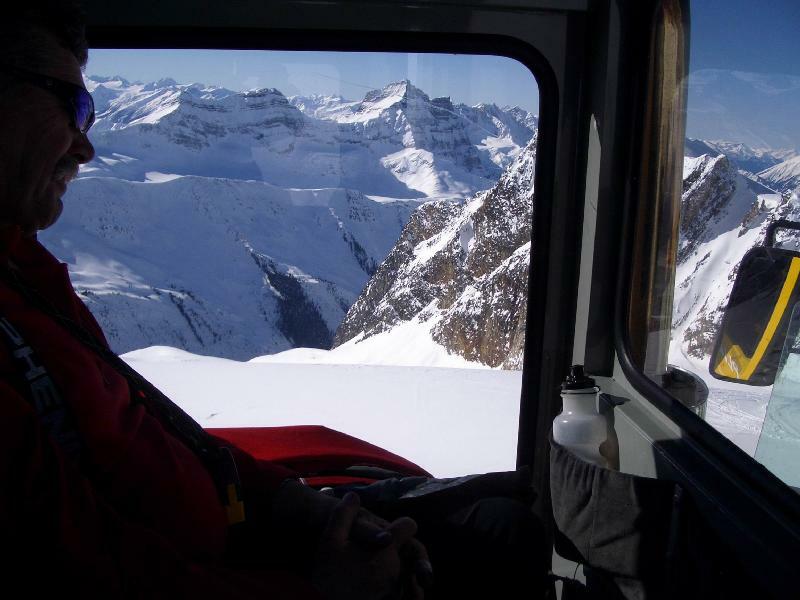 The front row of seats in the Metal Form cabs is raised and offers great views forward. 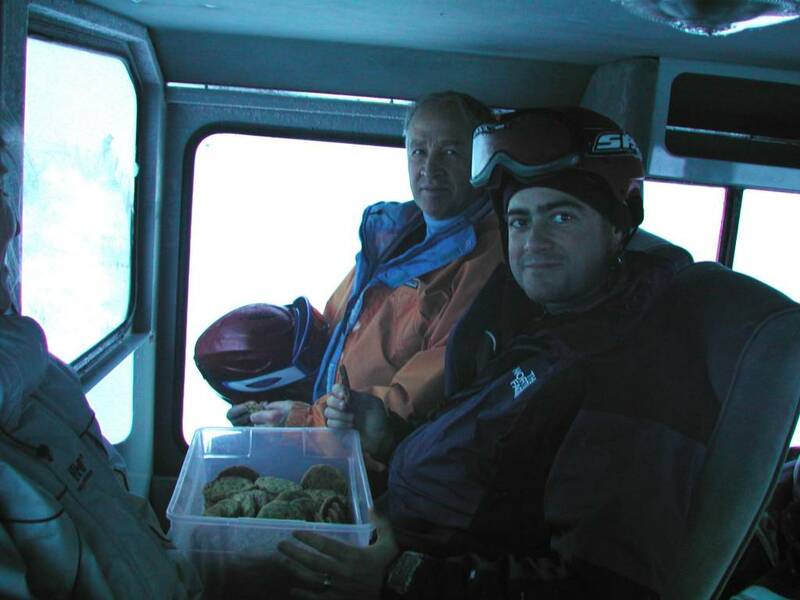 Sometimes, the passengers are better looking, but the cookies are always good. The front row of four seats provide unrestricted views on three sides, including the road ahead. The attractive cat "mascot" has a somewhat colder ride than passengers in the cab. Some mornings the windows get pretty iced up. The BR400 road cat building a snow road at Chatter Creek. Cats loading snowcat skiers in front of the brand new Vertebrae Lodge, in it's first year of operation. 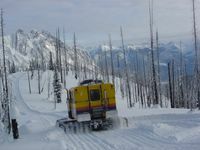 The rear entry cabs provide easier and safer entry compared with side-loading cabs that require skiers to climb over the slippery grouser bars on the cat treads. 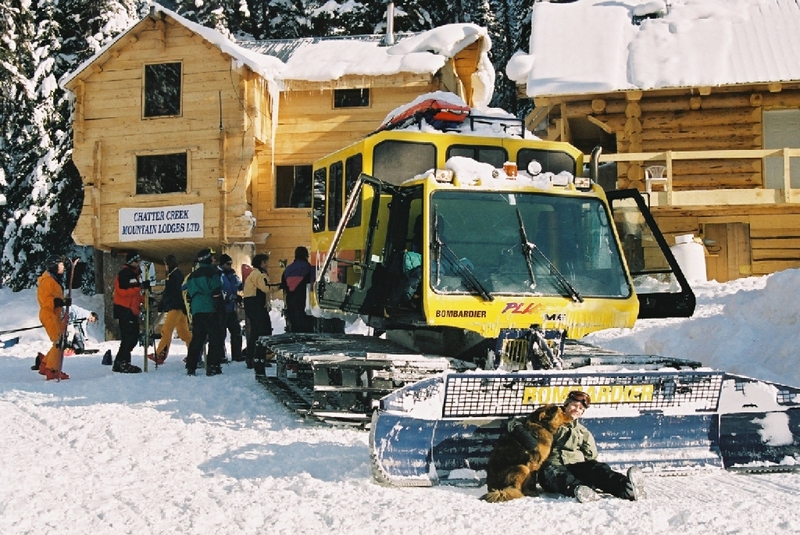 Picking up snowcat skiers and boarders in front of Chatter Creek's old Spruce Lodge. The "Spruce Goose", as it is fondly known is now used for staff accommodation. The building on the right is the Bath House, the first experiment in round-log building at Chatter Creek. 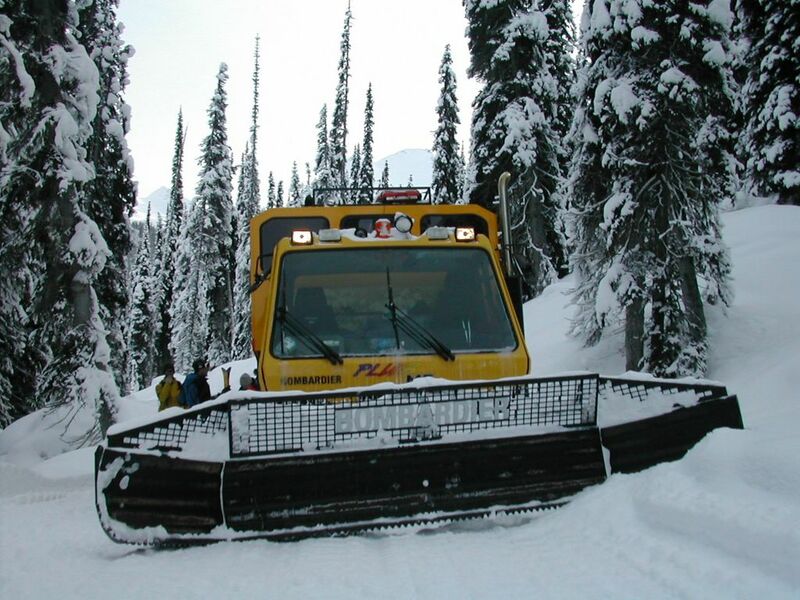 Chatter Creek maintains a backup cat that is used for building winter roads. It's a very busy machine in throughout December, building many km. of snow roads. In the case of a breakdown of one of the client machines, a spare cab that is kept on a hoist can be quickly lowered onto the backup machine and it is ready to service clients. In the late spring the cats support any logging done for summer projects as skidders, hauling logs and moving them around the log dump. Dale and a snowcat picking up a load. 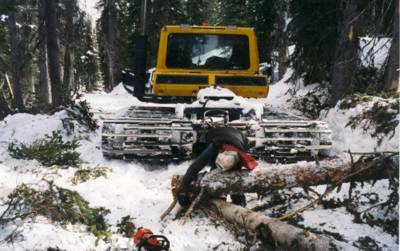 The crew were happy to get the logging done long before the mosquitoes, black flies and heat of the summer. Another log arrives at the log dump. Initially, over 300 logs were harvested for Veretebrae Lodge. A similar number were later harvested for Solitude Lodge. Many of the roads used for skidding logs were winter snow-roads, which would disappear as the snow melted. Chatter Creek purchases annual overhaul services from Bombardier Inc (now Camoplast) in Calgary, Alberta. Chatter Creek also purchases or leases its snowcat equipment through Bombardier (Camoplast) in Calgary. 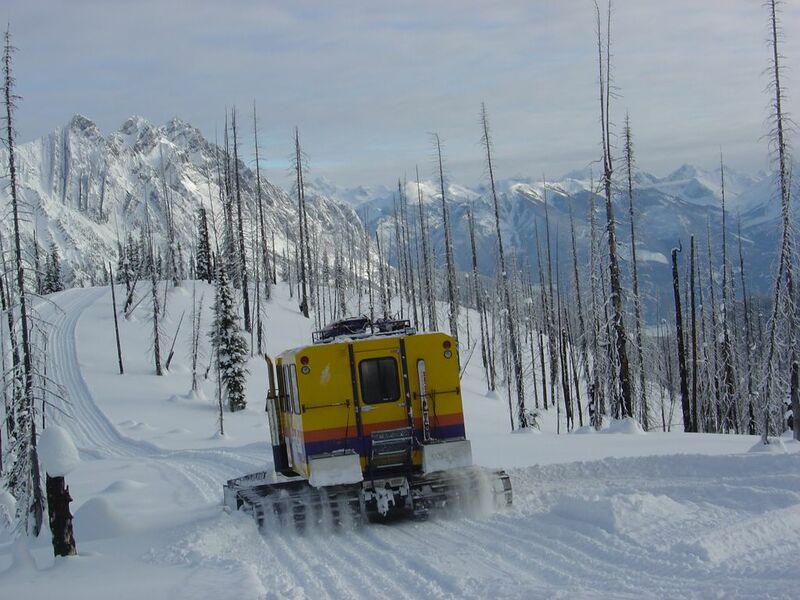 Chatter Creek finds that annual overhaul of its snowcats by Bombardier experts significantly increases reliability in the field and reduces field maintenance costs. Chatter Creek's on-site maintenance requirements is typically just daily inspections and 250 hr regular service, which is largely confined to maintaining lubricants and hydraulic fluid levels. No significant mechanical failures were encounterred in 2004, although there were some prior failures of electrical components. Chatter Creek currently leases it's snowcats through Bombarder Inc in Calgary. It acquires machines with 3000 to 4000 hours service and adds about 1000 hrs per year through it's snowcat skiing operations. Dan Josephson in the Bombardier (now Camoplast) BR 400 road cat. Chatter Creek owner and equipment operator extraordinaire, Dan helps keeps Chatter Creek going. 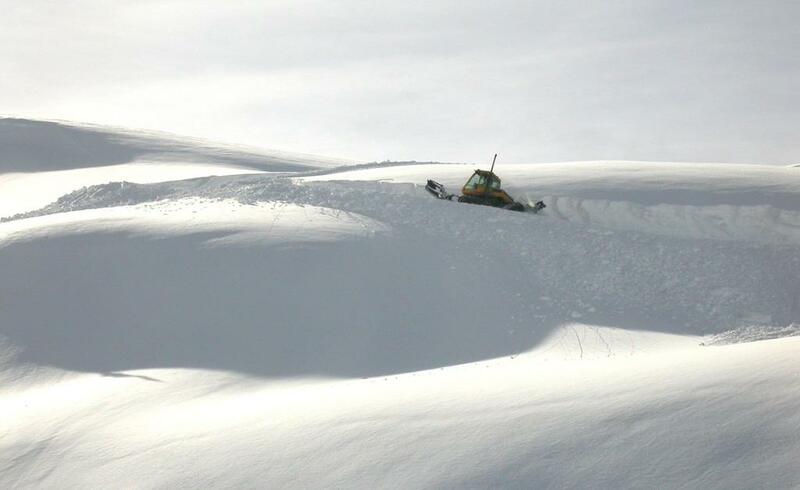 While his partner Dale McKnight spends countless hours out in the excavator or the road cat building cat roads, Dan fixs everything from snowcats, to coffee makers, and from generators to chain saws. Between them Dale and Dan keep things humming. Chatter News. 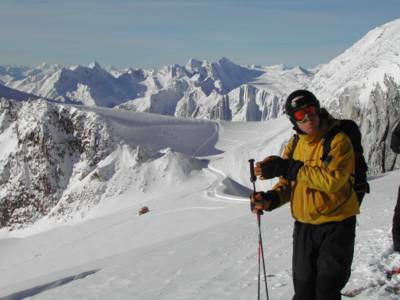 Ski Photography by Mark Gallup Glacier Skiing at Chatter Creek. Metal Form Industries - where our cabs come from. Here's Jason welding on one of the many aluminum oil field cabs built by Metal Form Industries in addition to aluminum snowcat cabs. After the cab is welded it is wired, insulated and skinned, after which it has a trip through the paint booth. 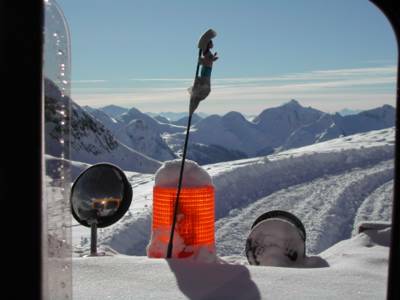 The pasenger cabs for the Chatter Creek snowcats are of aluminium construction. However, Metal Form works with steel as well. 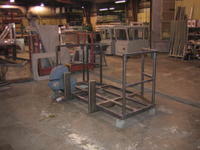 Here's Derek prepping and cleaning a steel handrail assembly for the paint booth. Click any image to enlarge it. 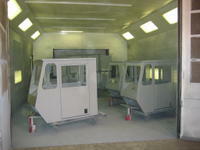 Small oil field service rig cabs coming out of the paint booth. For these products, Metal Form provides a primer coat only. The customer applies the final paint after the cab is installed on the service vehicle. In the case of snowcat cabs, Metal Form often provides the final paint. 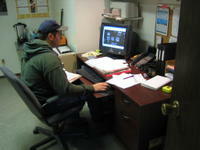 Mark working on the design of one of the many different projects that move through Metal Form. The company builds a wide variety of passenger and control cabs, and they are all designed in-house. 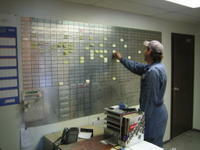 With so many projects on the "go" job scheduling is an important issue. 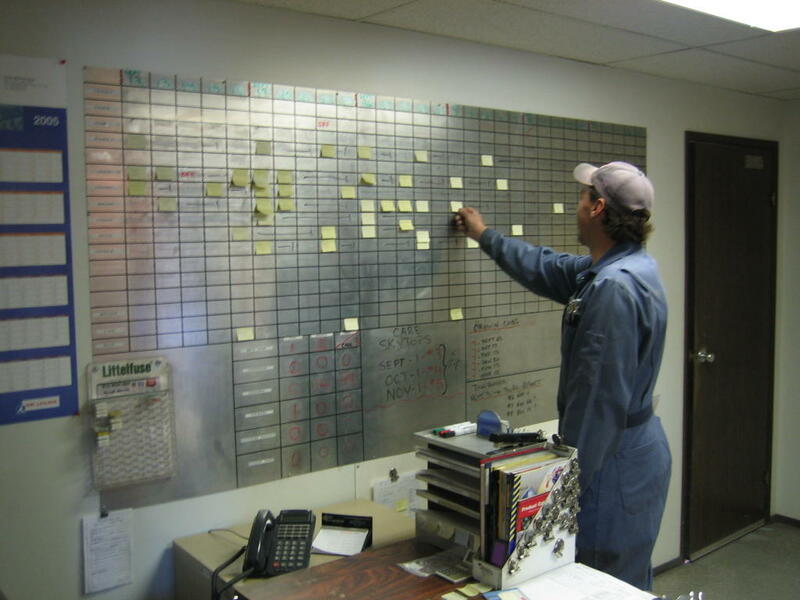 Here's Terry checking the schedule board to insure that all projects are proceeding as planned and insuring that they will be shipped to the customers on time. The Camoplast depot in Calgary Alberta provides sales and service support for all of Western Canada and much of Northern Canada. 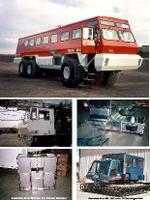 Camoplast in Calgary often has a large inventory of used snowcats for sale or lease. Click here for a Google map showing the location of Camoplast in Calgary, Alberta. Click any image for enlargement. - manufacturers of quality snowcat cabs. 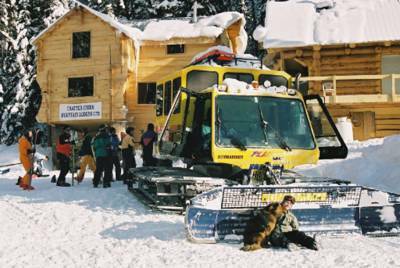 - Heli- and cat skiing directory. Scroll down for more about Metal Form Industries.